The NSW Department of Industry partnered with Western Sydney Business Connection, Campbelltown City Council and the Industry Capability Network to host the 'Meet the Buyer: Strategic Matching Event'. 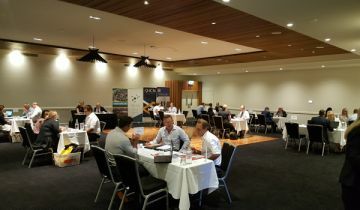 The event, from 9.30 am to 2.00 pm at Campbelltown Catholic Club, provided a fantastic opportunity for Western Sydney companies to meet some major project procurers and learn about potential upcoming business opportunities. About 24 small to medium sized businesses (SMEs) participates in free one-on-one meetings with a range of procurement companies from across the construction, manufacturing, health and education sectors. Procurement organisations taking part included Breseight Australia, Brookfield Multiplex, Campbelltown City Council, CPB Contractors, Dahua Group Australia, Fulton Hogan, Lend Lease Property, NorthConnex, South Western Sydney Local Health District, TAFE NSW, Thales, and Western Sydney University. Some major projects the procurement organisations are involved in include Barangaroo, Northconnex, Stockland Greenhills redevelopment, Green Square Aquatic Centre, Moorebank Intermodal Rail Link, Moorebank Logistics Park, Junee Correctional Centre, the Sydney Metro, Canberra light rail, various NSW highway upgrades, and work on Westmead, Northern Beaches and Nepean hospitals. The participating SMEs got the chance to make new business connections, find out about upcoming project opportunities for which they can potentially tender, and learn about procurement processes.